Discovered in 1797 by N.L. Vauquelin in Paris, but not extracted until 1828 by Wöhler (Berlin) and A.A.B. Bussy (Paris). 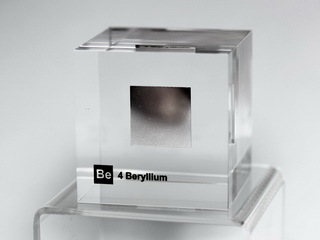 Beryllium is a light and lustrous metal which is obtained by the electrolysis of a fused halide (e.g. BeCl2). It is resistant to attack by air or water, even at elevated temperatures (red heat). 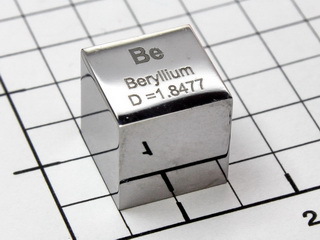 Beryllium is non-magnetic, is a good thermal conductor and is used as an alloying addition to copper or nickel, the alloys having excellent thermal, mechanical and electrical properties; in addition, when alloyed with nickel, the resultant Be/Ni alloy has the highest coefficient for secondary electron emission (12.3). Applications for pure beryllium include its use as windows in X-ray tubes and as a source of neutrons when bombarded with alpha particles, a technique used by Chadwick in 1932 in their discovery. Beryllium and its compounds are highly toxic, inhalation of the dust resulting in berylliosis, an inflammation of the lungs.